Why most low histamine food lists are so confusing. - Is Food Making You Sick? Why most low histamine food lists are so confusing. - Is Food Making You Sick? Why most low histamine food lists are so confusing. The Internet offers many ‘low histamine’ food lists. Reading them all can be confusing, because they often contradict each other. Low histamine food lists are not as simple as, say, gluten-free or lactose-free food lists, because gluten and lactose are either found in a food or they are not. Their existence is independent of storage conditions and freshness. Histamine levels, by contrast, fluctuate. A food might be low in histamine to begin with, yet high in histamine as it ages. Histamine levels in food also vary depending on the storage methods (e.g. freezing halts histamine development). Furthermore, some of these published lists include foods that may not have high histamine levels, but which contain compounds that provoke histamine release. Others do not. Many low histamine food lists do not take into account foods that may be DAO blockers. Moreover, they may not include mention of oxalate (oxalic acid), an irritant that can trigger histamine release, thereby causing the same symptoms as histamine. Oxalates can also contribute to the distress and debility of chronic fatigue syndrome and myalgic encephalomyelitis, because they damage and destroy mitochondria. High levels of oxalate in the intestines also hinder beneficial bacteria from colonizing the gut. Nor do many food histamine lists consider foods that release other biogenic amines, those which may contribute to HIT and which certain foods may release in some individuals, despite the fact that the foods themselves may not contain any biogenic amines. To add to the confusion, some individuals have published lists of foods which are tailored to their own unique body chemistry. That is, they themselves might be able to tolerate the foods on their list, but most other people cannot. One “low histamine” recipe-writer, for example, recommends using lentils, cocoa, berries and thyme, despite the fact that SIGHI (Swiss Interest Group Histamine Intolerance) describes lentils as “incompatible.” Histamine expert Dr Janice Joneja says, “Berries tend to be high in benzoates. Benzoates release histamine.” And, “There are certain herbs which release histamine. Thyme, for example, releases histamine.” Cocoa contains compounds that are known histamine liberators. Another person who blogs about mast cells has published “low histamine” recipes that include ingredients such as mushrooms, split peas, squash and quorn, all of which are described as “to be avoided” in numerous authoritative low histamine food lists from around the world. Even the most authoritative lists, compiled by medical researchers, can have disparities. There is disagreement about a wide range of fruits, vegetables and spices including cherries, grapes, cranberries, blackberries, peaches, apricots, nectarines, pears, black-currants and red-currants, blueberries, kiwi-fruit, pineapple, plums, papaya, mushrooms, broad beans, pumpkin, anise, cinnamon, nutmeg and cloves. Legumes and pulses are also debatable. Some lists include non-soy legumes such as dried beans and peas and lentils. All lists ban soy and red beans. Again, some lists ban all nuts, while others forbid only walnuts, pecans and cashews. This is why “Is Food Making You Sick? 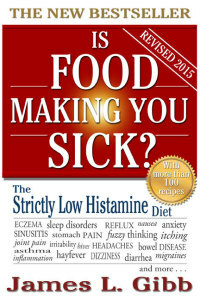 The Strictly Low Histamine Diet” recommends only those foods which have been agreed upon by every genuine, science-backed and meticulously researched source. The low histamine food list in this book is strictly low histamine, as are the recipes. This entry was posted in Blog, FOODS, HISTAMINE, HISTAMINE INTOLERANCE and tagged food, Histamine. Bookmark the permalink. ← Should Histamine Intolerance sufferers go gluten free? Thanks for your great article, I have ordered your book and am looking forward to receiving it. I too am starting this journey and have been very confused about all the conflicting lists, it will be great to have a resource at my fingertips with all the currect information. I’m particularly looking forward to the recipe section as I am a food lover and it is disheartening thinking you can eat something you love then after eating it seeing it on a different high histamine list ! Yes, I’m sure all fellow HIT sufferers feel the same way – so many of our favorite foods are histamine liberators or high in histamine! We have to be quite inventive to devise delicious substitute dishes. But as I always say – the great thing is that once your body’s histamine load has subsided to safe levels, fortunately you can begin to re-introduce other foods one by one into your diet. People with HIT are not doomed to a life of restricted eating. And yes, we have included a great many recipes in the book, on purpose to help people continue to enjoy their food while they are returning to good health. Thank you for your comment! hey, great article! I have bad histamine reactions , amongst many other health/nutritional issues and what you say here about “misleading information” is very true! I have searched and compiled numerous lists of histamine food lists. I just see what ones are mostly listed on the “high” lists and avoid those and/or I have tried them and see how I felt eating in smaller quantities. I love eating and overeating, so thats a huge challenge for me, but most of us could handle most foods in very small quantities. I react to almost every food out there, so I get it. Another side note for anyone reading this: Benadryl Dye-Free. I take this stuff everyday. I flush myself out with lots of water, sauna, etc to detox, but this stuff is more “pure” than normal Benadryl and it has helped me immensely with dealing with histamine intolerance and inflammation. It sounds as if you’ve experienced what so many people have experienced – bewilderment about what foods to eat and what foods to avoid when we want to lower our histamine levels for health reasons. It really is a complex issue, when testing for histamine in foods involves so many variables. This is one of the chief reasons the Strictly Low Histamine Diet was devised – to endeavor to clarify the issue. Fortunately, once histamine levels are under control again, people can gradually (and carefully) re-introduce those foods into their diet. It’s good to hear that you have found an antihistamine medication that helps you. This seems to confirm that your health problems really are histamine- related. A word of caution, however – try not to become reliant on meds to ease your symptoms. Diphenhydramine (Benadryl dye-free) can have some unwanted side effects. Diphenhydramine is an ‘H1 blocker’ that is, an inverse agonist of the histamine H1 receptor. “* Taking these medications daily for long periods of time may result in your body becoming tolerant to their effects, meaning that you may need to take larger doses to obtain the same relief. * They may cause weight gain by increasing your appetite – especially H1 blockers. As long as you’re aware that the Benadryl is likely to be increasing your appetite, that its efficacy may decrease over time, and that it’s only a short-term (but helpful) solution, I’m sure you’ll use it wisely. Wishing you a speedy return to good health on the low histamine diet!